Humpbacks are known for their acrobatic and friendly nature. Their round body requires them to lift their tails out of the water when they take a deeper dive, making them a favorite of whale watchers everywhere. Other exciting behaviors include breaching, flipper slapping, spy hopping, and open mouth feeding. The Humpback is the most widely studied large whale species. The underside of each Humpback whale's tail flukes are individually patterned, ranging from all black to all white. Researchers, therefore have identified and cataloged a large portion of the humpback whale population, allowing them to collect considerable amounts of research data. The Finback is one of the most exciting whales to encounter. Its size is breathtaking-it's the second largest animal ever to roam the earth. A full grown Finback can be 75' long, which is larger than many whale watch boats! The Finback is also the only universally asymmetrically colored animal in the world. The whales right lower jaw is colored white, while the left is all black. It is thought that the whales use this coloring to confuse schools of fish, making it easier for the whales when feeding. 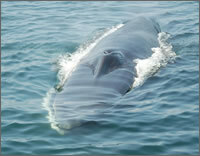 Minke Whales are one of the most frequently sighted animals in the Gulf of Maine. They are the most common whales on a world wide basis, found in all oceans. Minkes are the smallest of the great whales and are known for their erratic and unpredictable swimming patterns. Atlantic White Sided Dolphin add excitement to any trip we see them on. Traveling in pods of anywhere between two and two thousand they are often curious and playful. They are impressive swimmers, and truly amazing to observe in the wild!